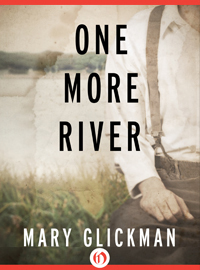 One More River is one of those special novels that one should read slowly, little by little, in order to enjoy it. Its prose is so rich, so beautiful that it flows like a peaceful stream and not like the wild waters of the Mississippi on whose shores a big part of the action takes place. The author through her story travels the reader back to the past of the American South; a past that smells of death and of change; a past full of conflict and love; a past where racial discriminations were the canon and where dreams were not that easy to come true. This is the story of a father and a son, Bernard and Mickey Moe Levy. Mickey is a young Jew who in 1962 meets and falls in love with a beautiful and brave girl that goes by the name of Laura Anne, whom he’s determined to have as his wife. However, no matter what he, or she for that matter, wants their coming together is not a given, since Laura Anne’s parents refuse to give her their blessing, because of the unknown origins of Mickey Moe’s father. Bernard always was, to say the least, a mystery to the locals in Guilford, Mississippi. As the old-timers could recall, he arrived one day in town with pocketfuls of gold and decided to make a home there, but nobody, or almost nobody, had any clue as to where he came from and how he got his money, thus even after he was dead, the people never stopped throwing suspicious glances towards his household. So, who was Bernard? Where did he start from and how did he end up there? How come he got to marry beautiful Beadie who was everything that he was not? And what was his real relationship with Bald Horace and his, virtually and visually, enormous sister, Aurora Mae? These are the questions that Mickey Moe needs to find answers to in order to solve his issues; however, to do that he has to put everything on hold for a while and travel far and away in order to trace his father’s footsteps in history. The author, through her oral and sing-song like narration, takes us back and forth in time and gives us the extraordinary yet simple stories of two men; that of Bernard, who left his home at the age of thirteen in order to seek his fortune elsewhere and his amazing journeys up and down the Mississippi, and that of Mickey Moe, a young man who’s willing to anything he possibly can to marry the love of his life. Their travels seem to follow parallel roads, they even seem to converge every now and then, but at the end of the day they are different, since the one has spent a whole life trying to create his personal myth, while the other just struggles to earn the right to live his. This is an outstanding novel that for some, not all that strange reason, reminds us of a lovely and somehow nostalgic blues song, and as such it deserves to be read -and yes, even be heard- by everyone who loves good literary fiction. It comes out in America next week.